I hope they didn't use the 'falling' snow. That stuff seems to float up as well as fall down and stays up in the perms for years. Ahh those good ol' Santa Anas...I'd almost forgotten how hot it gets in September and October there. "Steaming cauldron"...heh. Is it still growing more humid in SoCal? Still, you haven't known 'steamy' until you've spent a summer in Nashville! 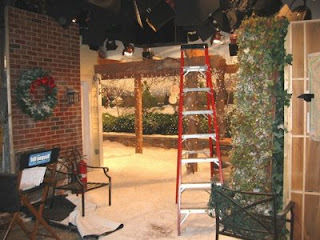 They used both types, so we did indeed find some melted plastic "snow" on some of the lamps.